The following tutorial introduces you to the Information tab on the Backstage View. You’ll learn about marking a workbook as final, which makes the workbook read-only. You’ll also learn about permissions - both encrypting the workbook with a password and restricting permissions. 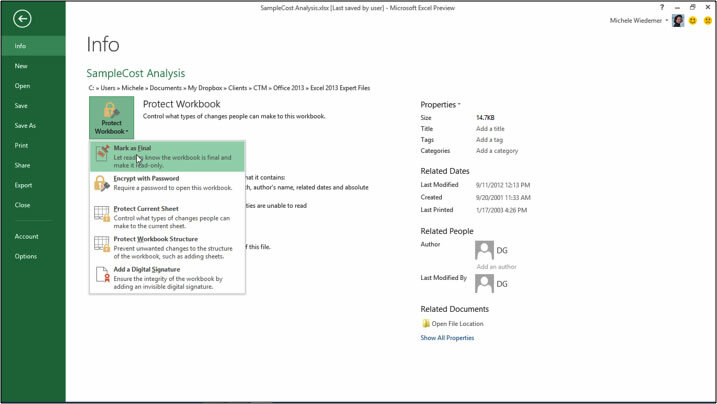 This tutorial explains how to protect both the current sheet and an entire workbook’s structure. For MS Excel training classes in Chicago and Los Angeles call us on 888.815.0604. To mark a workbook as final, use the following procedure. Select the File tab from the Ribbon to open the Backstage View. Excel displays a warning message. Select OK to continue. 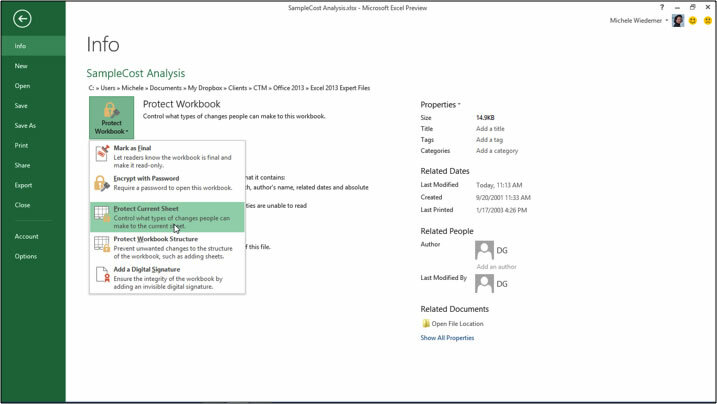 Excel displays an information message. Select OK to continue. 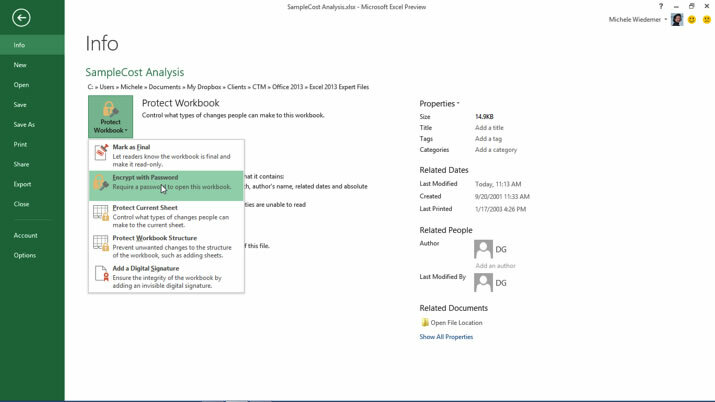 Notice the yellow bar at the top of the workbook to indicate that the workbook has been marked as final. Notice that on the Info tab on the Backstage View, the Permissions area has changed. To encrypt a workbook with a password, use the following procedure. 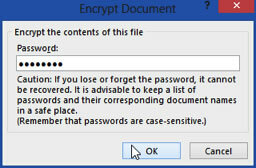 In the Encrypt Document dialog box, enter the password that you want to use. 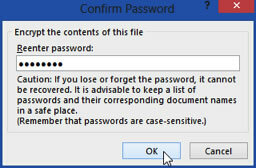 In the Confirm Password dialog box, re-enter the password that you want to use to confirm it. Note that if you want to remove the password protection, you’ll repeat the process. However, leave the password field blank. To protect a current sheet of a workbook, use the following procedure. 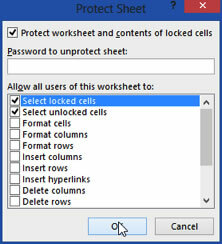 Excel displays the Protect Sheet dialog box. You can enter a password if desired to unprotect the sheet. Check the boxes for the actions that you want to allow other users to perform on the sheet. To protect a workbook structure, use the following procedure. 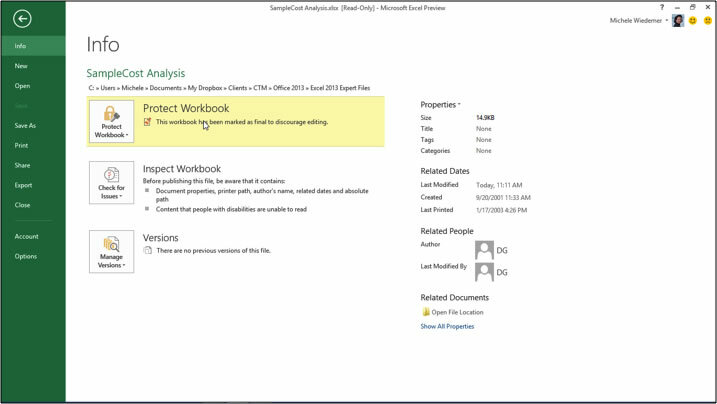 Excel displays the Protect Structure and Windows dialog box. Check the boxes for the options you want to protect. You can enter a password if desired to unprotect the workbook. Through our network of local trainers we deliver onsite group Microsoft Excel training right across the country. View our Excel training student testimonials or obtain a quote for a customized Excel class.